Janet Laurence held her first solo exhibition at Central Street Gallery in Sydney in 1981. It took the form of a multimedia installation combining paint, found objects such as shells, leaves, bones, rocks, sand, strips of photographic paper stitched together and fabrics, all distributed as if cast up on the shoreline. Her inspiration for the form of this work came as much from the music of Philip Glass as it did from her academic training. She immersed herself in Glass’ opera ‘Einstein on the beach’ while she worked on the piece so that it took on the rhythms of the rise and fall of the musical tide. Unlike Glass’ music, however, there was nothing minimal about Laurence’s installation; it was a chaotic and excessive accumulation animated by a genuine creative rhythm. It held the seeds of her later and more authoritative installations from the late 1990s through to the present, including her prolific contribution to public artworks in the landscape and in public buildings. 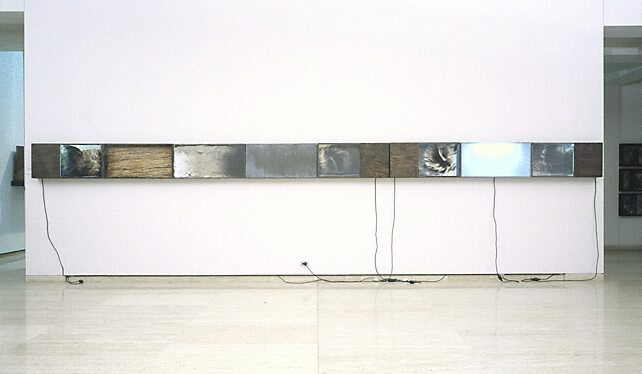 In her 1988 exhibition at the Canberra School of Art Gallery, her wall works were hung in grids but the whole space was unified by a corresponding grid of ash laid on the floor. One of the first works after this to evolve into installation was ‘Forensic’, a memorial to her beloved dog Zelda. ‘Forensic’ contains all the things you might find in a memorial shrine. Behind the glass are close-up photographs of Zelda’s thick wavy fur, ashes suggesting the departed and straw. All are materials relating to living matter and its transformation, and similar natural organic and mineral materials have formed the basis of her alchemy ever since. It was the first of a number of multimedia assemblages in boxes or under glass that trace a path to works like ‘The matter of nature’ 2000 (AGNSW collecton). Laurence will admit a debt to Joseph Beuys, particularly his use of materials but also his passionate involvement with the environment and with the nature of being in the world. Like Beuys, Laurence is an inveterate collector of natural objects and what she likes to call ‘substances’. In ‘The matter of nature’ she includes stuffed birds with glass laboratory vessels, sulphur and salt, all the stuff of life drawn from the mineral world to which it returns. Her use of the birds also harks back to her interventions into natural history museum collections. In one of these installations the Melbourne Museum invited her to work with its collection as an artwork. She chose to bring a vast collection of stuffed birds together into a glass case and in another she arranged stuffed animals, which she later photographed as reflections in the ubiquitous glass surfaces of museum display cases. In this work the case is itself rather clinical and suggests scientific specimens rather than the aesthetic context of an art museum. Signed verso [part a], red fibre-tipped pen "J Laurence [upside down]". Not dated. Signed verso [parts b & e], red fibre-tipped pen "J Laurence". Not dated. Anthony Bond, Contemporary: Art Gallery of New South Wales Contemporary Collection , 'Objects and associations', pg.332-381, Sydney, 2006, 352 (colour illus.). Victoria Lynn, Review: works by women from the permanent collection of the Art Gallery of New South Wales , 'Women artists in the contemporary collection', p13-15, Sydney, 1995, 15, 41. Wayne Tunnicliffe, Look , 'Past/Present/Future: the importance of collecting contemporary work and Contempo's contribution', pg.14-15, Sydney, Apr 2003, 15 (colour illus.). Look , Heidelberg, Dec 1997, 23 (illus.). Above the lake, below the sky , 1992, (illus.). This work is not in this exhibition but is illustrated in the catalogue. Sight lines: women's art and feminist perspectives in Australia , 1992, (illus.). The boundary rider: 9th Biennale of Sydney , Sydney, 1992, 143 (colour illus.). This work is not in this exhibition but is illustrated in the catalogue.